All of the nutrient minerals work together to keep you healthy and feeling good. Here is a summary of the role of potassium, a major mineral, in your good health. Potassium is found in all living cells, whether they are from plants or animals. This is a good thing, because potassium is an important mineral that is involved with many processes in the body, and its abundance in foods, makes it easier for you to get enough in your diet. Potassium is a positively charged ion or electrolyte found in large concentrations inside your body’s cells. Its relationship to sodium ions is important to heart function, muscle contraction, nerve transmission and the transfer of nutrients and waste in and out of the cells. From the moment you are born, your body spends a large portion of its energy maintaining what health experts call “homeostasis.” That is, your body is at its best when such things as your blood chemistry, fluid levels and temperature are constant. When it’s cold outside, your body expends energy to keep your temperature at 98.6 degrees F, which is normal for most people. Whatever your diet includes in a given day, be it fast food or haute cuisine, your body sorts out the nutrients and allocates them to wherever they are needed and excretes or stores or excretes the rest. Nutrients are constantly being moved into your cells and waste products are constantly being moved out of your cells to maintain your optimum level of health. Although this is a very simple explanation of a complex process, it is important to mention here, because potassium is important in maintaining homeostasis. Many people think of bananas when they want to improve their dietary intake of potassium, and there is no doubt that bananas have a significant amount. In fact, fresh, whole fruits and vegetables are the best sources of potassium. However, you can also find potassium in nuts, seeds, meats, milk and legumes. Since potassium is abundant in a wide variety of foods, deficiency of this important mineral is generally due to factors other than low dietary intake. Major among these factors is the use of diuretics and laxatives. In addition, those suffering from alcoholism, anorexia nervosa or bulimia are also susceptible to potassium deficiencies. --Caveat for Potassium Sources and Functions: A depletion of potassium can severely disrupt the electrolyte balance in your body, which can lead to heart problems and even death. 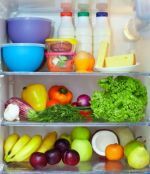 The increased use of salty, processed foods in the diet has raised some concerns about the effect this has on potassium levels in the body. Since there is a constant balancing act between sodium, calcium and potassium levels, the overuse of sodium chloride (table salt) could have adverse effects on your body’s ability to maintain homeostasis and to fight disease. The problems most impacted by potassium levels in your body are stroke, high blood pressure and osteoporosis. If you take potassium supplements, you should be sure to let your doctor and pharmacist know, since there can be significant drug interactions. Click here to go from Healthy Eating Minerals-4 page to Water page.